The Imperial Armour Police Vest is our latest in design and technology. The Police vest offers full protection in a more comfortable and snug body fit. It is designed to be worn over conventional clothing, and is extremely versatile. The male concealed vest is available from size small to X- Large. Available in 3 Levels of security. The female concealed vest is available from size small to X- Large. Available in 3 Levels of security. Front, Back and Side Protection. This multi functional vest may be worn over clothing or under a uniform for covert protection. 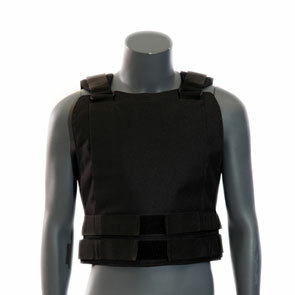 Designed as a basic armour vest for the police and private security companies. Supplied with front and back plate pouches. Area of ballistic coverage (Size large): 0.30m2. The canine bullet proof vest provides protection for dogs used in crime prevention activities including police dogs, dogs deployed in private security and anti poaching activities. The canine vest is tested to NIJ level II protection and is size adjustable suitable for medium to large dogs. Imperial Armour SWAT Vest is designed for comfort and versatility. Front opening with back plate. Kevlar overlaps zip at front to offer full protection. Optional neck protector. Lumbat belt for support.